Last week Camara made their 50th container shipment of computers to disadvantaged communities through the on-going support of The Arthur Guinness Fund. Irish Rugby player Jamie Heaslip, who is an ambassador of the Arthur Guinness Fund, took time out of his busy schedule to lead a team of 8 people to help pack the 40ft container containing over 500 computers, including one of his own, for travel to Ethiopia. Camara, one of the beneficiaries of the Arthur Guinness Fund, is dedicated to using technology to deliver education more effectively to disadvantaged communities in Ireland and Africa. The organisation takes in used computers from Irish companies and individuals and has a team of dedicated volunteers who prepare the computers to ensure they are in optimal condition for re-use. This rigorous process involves wiping each hard drive of data (in line with US Department of Defence standards), refurbishing and loading each computer with educational software, and finally setting them up as Learning Centres in Ireland and African communities. Also speaking today John Fitzsimons, General Manager, Camara said “We are delighted to have the support of the Arthur Guinness Fund and their ambassador Jamie Heaslip. As a result of thousands of people just like Jamie, who have donated their computers to us, we are now in a position where we can begin to see the positive impact in disadvantages communities by providing working computers, software and training for educational purposes to thousands of people”. 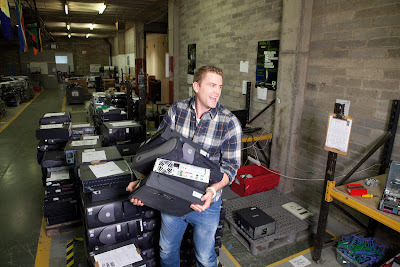 Since receiving funding from the Arthur Guinness Fund, Camara has opened computer recycling centres in Belfast and Galway. Camara has to date received a total of 30,000 computers from Irish individuals and companies, including a donation of computers to the value of €70,000 from Diageo. To follow the journey of Jamie’s computer as it travels from Ireland to Ethiopia and for other good news from the Arthur Guinness Fund log onto the Guinness Ireland Facebook Page. blablabLAB - Be Your Own Souvenir!